Imitation is the highest form of flattery, right? Well, sometimes it’s not flattering – it’s just blatantly ripping off. Case in point: Kaeson Youth park in North Korea. Now, I’m pretty familiar with both entrances to the two Great America’s here in the United States (they were built as twin parks after all, back in the mid 1970’s…) They both feature a unique, double-decker carousel, which is actually just one carousel with two individual decks. 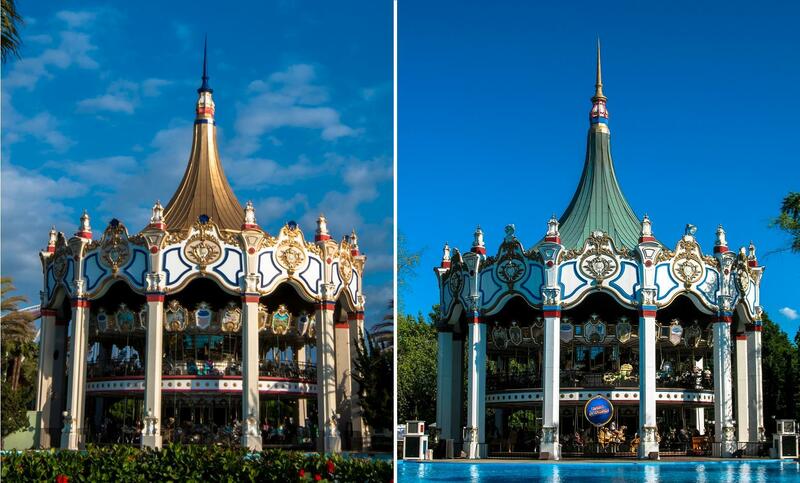 Santa Clara’s (left) and Gurnee’s (right) nearly twin carousels. Santa Clara’s is a foot higher, but the perspective is off due to non-matching focal lengths. Photos © 2008 & 2013, Kris Rowberry. This is why knock-offs are never better than the original – no matter what the price! At least they got the staircases right – albeit, they put them in the front instead of the rear…wait – where IS the front?!? This just goes to show the impact of Randall Duell’s design – a ride as iconic as Carousel Columbia was actually copied (albeit badly) thousands of miles away. Just don’t get me started on the abnormally long first drop of the coaster next to it – that’ll be for another post! May 8, 2014 | Categories: Amusement Parks, Lost Parks, Theme Parks | Tags: abandoned amusement park, amusement park, california's great america, carousel, carousel columbia, copyright infringement, great america, great american thrills, kaeson, kaeson park, kaeson youth park, Kim Jong Il, kim jong un, korea, kris rowberry, kristopher rowberry, north korea, six flags, six flags great america, worlds tallest carousel | Comments Off on North Korea’s Great America? 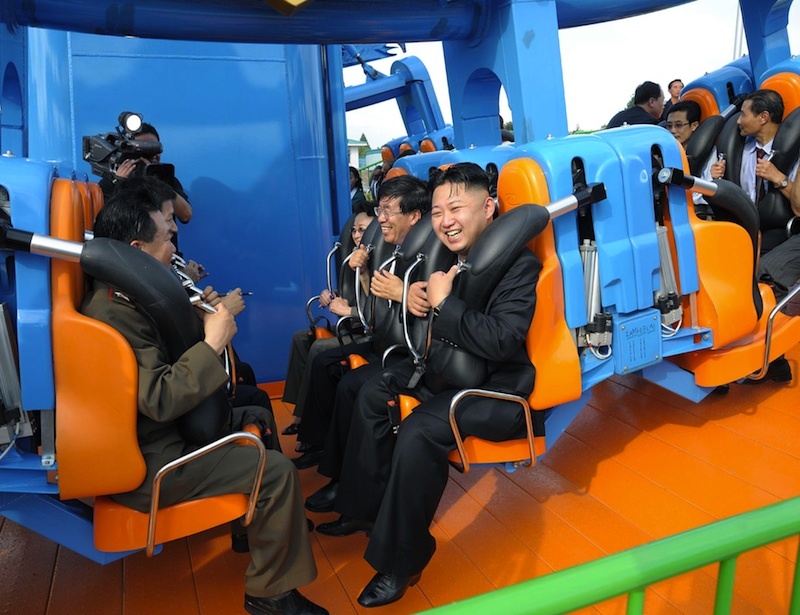 Kim Jong Un – Amusement Park Expert? Photo Credit: Korean Central News Agency (KCNA) NOTE: State-run media. Yes, it’s everyone’s favorite twenty-something “threatening to nuke the U.S.” ruler, Kim Jong Un. From the sound of it, he knows quality amusement park traits. 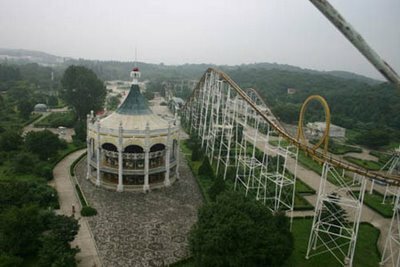 Un was at a North Korean amusement park last year, where he took in the rides, the scenery and the crowds that were carefully staged to be there (probably at gunpoint). But, he also lambasted the park for potential safety issues with their water slides, poorly maintained showering facilities, weeds growing out of the asphalt and even peeling paint on the rides. 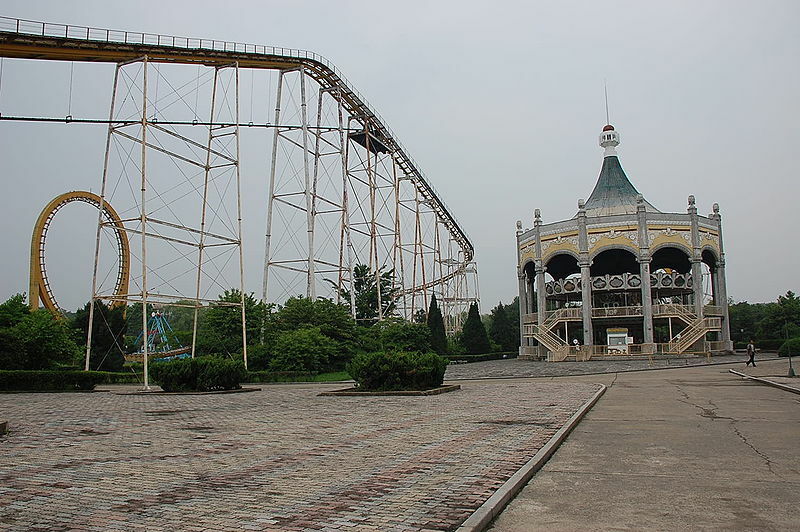 First of all – who would have thought North Korea would even HAVE an amusement park. For most people living there, just getting food is a daily chore, let alone having FUN in the process. Secondly – is this the first time we’ve seen a Head of State actually partaking in a thrill ride in front of the media? Who knows – maybe that’s why Mitt Romney lost the election – we didn’t see him on a coaster. April 14, 2013 | Categories: Amusement Parks, General Travel, Theme Parks | Tags: amusement park, amusement parks, crisis, election, fun, great american thrills, host, Huell Howser, kim jong un, korea, kris rowberry, kristopher rowberry, mitt romney, north, presenter, south, the next, theme park, theme park overload, theme park review, theme parks, travel, travel host | Comments Off on Kim Jong Un – Amusement Park Expert?